Well, here I am back at the blog posts again, and managing to make it back within the 18 months I mentioned on my previous post about communication! During the past 15 months, there have been many blog posts written - mostly in my head, but one or two have made it to draft form on here, but none have actually seen the light of publication! I'm sorry about that! I'm sure you've not missed my ramblings, but I'm genuinely disappointed in myself for not making the time to share my cataloguing thoughts with you, although in reality there haven't been many thoughts about the act of cataloguing, nor about RDA, nor hardly about the future of cataloguing, as I've been distracted by so many other things recently! So, I've just read a call for papers for a local conference, the topic of which is centred around that of trust. An interesting topic, which I believe is relevant to all of us, which made me think about my own approach to building trust. I don't think it's something I consciously do. It's a bit like my approach to communication I was telling you about in the last blog post - something that is such an integral part of me, and the way I think and operate, that I simply automatically live by these rules - if you want to call them rules! I suppose this is actually about supporting people, in whatever way I can. For me, life is about human relationships, and it's those relationships that build the world. 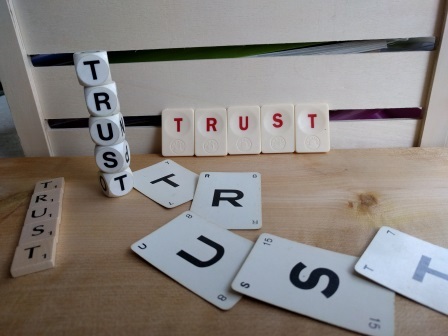 There is simply enormous satisfaction to be had from supporting people to develop and achieve, to grow and to succeed, and being effective at supporting them helps to initiate and cement trust. People are invariably most interesting to listen to. Each of us is unique, we've all had different experiences, and we all have so much to share and to learn from each other, that to not listen to others would mean missing out on so much. Listening to others, and being interested in them helps to develop trust - both ways. Bit of a customer service mantra, this one, really, but I think it applies in many situations where people are involved! I guess it's about managing people's expectations, so they are not left disappointed, angry or sad, as such negative emotions can lead to a breaking down of any trust that has been built up - and it sure is a difficult hill to re-climb. Yes, agreed, this one sounds rather like the previous one, but it is subtly different in emphasis. So, you've not promised things that are not within your gift, but equally, you won't let anything get in the way of the things you have agreed to deliver, so you can keep that promise. Eek, I didn't much like writing either of those two words, but it is so very important not to be drawn into the grapevine, the rumour machine, the office politics. It would be easy to do, but quite catastrophic for a relationship with work colleagues. If people tell you something in confidence, don't be the one to break that confidence by sharing with others - at least, not unless there are lives at stake - and never let yourself be drawn into judgmental conversations about colleagues. The place for being the real you is at home, with your loved ones, who accept you for exactly who you are, warts and all, as a friend of mine used to say! But, there is absolutely no harm done, and probably lots to be gained, by showing yourself to be human at work, now and again. Obviously, I'm not suggesting that one should show one's vulnerability at every opportunity (if indeed one was that vulnerable), but occasionally it's good for people to understand that we're all people, and we're all in this together, and a little bit of trust and support goes a long way. So, that's my thoughts on building trust. As ever I'd be pleased to hear your views, and what you do to build trust between yourself and others, after all, we're all different and all have our unique ways of doing things.